Having a water leak in your home can be a nuisance, and it can also be very expensive. It’s not always obvious that you have a leak, so if it goes unnoticed, it can make your water bills rocket. Kitchen sink leaks are a lot easier to notice than a toilet leak, as more of our time is spent in the kitchen than the bathroom. You need to be aware of what to look out for so you can avoid having to pay for water that you aren’t even using. 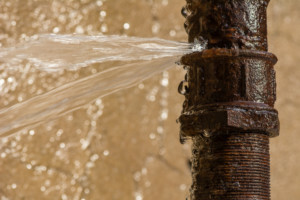 If you think you have a water leak, then get in touch with a local plumber. They’ll be able to diagnose the problem and get it fixed for you as quick as possible. Checking your water meter is one of the easiest ways to see if you have a leak somewhere in your plumbing system. When you read the meter, make sure that no water is being used inside or outside while you check it. There should be a leak indicator on your water meter, if this is moving, there is a very high chance that you have a leak. Another way to test if you have got a leak is to take your meters reading, wait for a few hours, and then take it again. Don’t use any water inside or outside of your home in the hours between the readings. If the reading has changed, you have a leak somewhere in your system. • Find the main shut off valve to your home’s water supply then use it to turn off your water. This can be located in a variety of places, but most commonly it will be found behind your outdoor faucet. • Once the water is shut off, check your water meter again using either the reading method or the leak indicator. If the indicator is still moving, or the reading has changed, then your leak is outside. If the indicator isn’t moving, and the reading has stayed the same, then the leak is inside of your home. Although the plumber in Weatherford TX you call out will be an expert in what they do, it does make it a lot easier for them if you have located whether it’s inside or outside. If you can’t determine where your leak is, don’t worry, it’s not mandatory that you know before calling a plumber for help. • Leaking faucets – When you have a leaky faucet, it’s often because the rubber washer has worn down. Replacing these isn’t a big job, and it’s pretty easy, but you need the correct tools for it. The plumber will have to shut off your water at the main shut-off valve or under your sink, then remove the faucet handle, as the rubber washers are located under the handle. • Leaking toilets – Toilet leaks aren’t the easiest to notice, as they are often silent. They can waste gallons of water and lead to an expensive water bill. Surprisingly, toilet leaks are quite easy to repair and aren’t too expensive. A great way to find out if you have a toilet leak is to put some food coloring or a dye tab into the toilet tank then leave it for around 30 minutes (don’t use or flush the toilet while doing this). If the water in the toilet bowl has some of the dye color in it, then you have a leak. If the water is still clear, then you do not have a leak. • Leaks in the overflow tube – One of the causes for toilet leaks is if the water level in the toilet tank is too high. The water level should be around half an inch below the overflow tube. If the water is higher than this, it will spill into the overflow tube. This problem can be sorted out at home, but it’s best to call in a plumber as doing it on your own can cause more trouble, and the plumber will know exactly what they are doing so it can be fixed quickly. • Flapper valve leaks – Flapper valves are the most common reason for toilet leaks. The flapper is a rubber valve that’s in the bottom of the toilet tank. For the flapper to cause leaks, it may not be working properly. It could be cracked or worn and if so, it will allow water to flow from the tank into the toilet bowl continuously. When it comes to leaks that are outside of your home, they are going to be underground. If you think you have an outdoor leak, then you can look around your property for wet patches or feel the lawn for them. If you come across one then keep an eye on it, if it doesn’t dry up then you most likely have a water leak below it. Whether you live in Fort Worth or Seattle, it’s always best to call in a local plumber. Not only will they have more experience with the water in your area, but you’ll also be supporting local companies.